Welcome to North Tampa Christian Explorers, a preschool that’s a great way to start the journey at North Tampa Christian Academy! We are a community-based preschool serving children from ages 2 to 5 years old. At North Tampa, we follow the Constructivist Approach, with children and educators “co-constructing” their own learning as they bring their unique life experiences to the classroom. From the design of our indoor and outdoor classrooms to the interactions and experiences that take place on our campus, everything we do is intentional, reflecting our beliefs about the ways in which children best learn and honoring the child as a uniquely created individual. We are grateful to partner with you in this great exploration we call early childhood! Learn best in a hands-on, developmentally appropriate, nurturing environment where they are challenged and supported to explore in ways that are meaningful to them. Are fully capable of constructing and adapting their knowledge through discovery, collaboration and communication. Naturally learn from the world around them, both indoors and outdoors, ideally within environments intentionally designed to make the most of their natural curiosity and love of play. Are fully capable of creating beauty and expressing themselves in a myriad of unique, varied ways. Have the right to make safe and helpful choices that impact their daily lives. Know their children best and are their first teachers and are part of a school/family relationship based on mutual respect, trust and open communication. Are welcomed and encouraged to be actively engaged in their child’s educational experiences. Have the right to know their child is in a safe, nurturing grace-filled Christian environment. Are co-partners in growing happy children in the knowledge and grace of God. Know that each child is divinely and uniquely created by God, with individual needs, wants, ideas and perspectives that deserve to be heard, shared and respected. Are accountable for the safety and learning of the students in their care. Take time to know their students on an individual level through conversations and observation, building relationships, encouraging progress and developing curriculum to meet each child’s needs. Encourage the natural curiosity among all students and become co-explorers. Is an essential component in our mission to serve one another, our neighbors and people around the world. Is greatly benefited by having a center of excellence for Preschool in its midst. Is rich with opportunities and experiences for our children to grow, learn and give while developing an identity of service and stewardship. Much like the varied patterns of children’s growth in the early years, our approach is fluid, constantly being modified based on our observations of our students, the world around us and best practice. We believe God created us as individuals. As such, one size does not fit all at NTC Explorers. We follow a child-centered model as opposed to a materials-driven model. Our carefully selected philosophies and curriculum guide us as we create the ideal context for each child’s emotional, physical, spiritual and mental growth. Each child is given the support needed to progress and grow in a developmentally-appropriate fashion. Equally important, all children are challenged to stretch themselves and persevere as they make sense of the world around them. 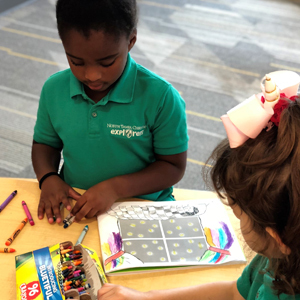 In harmony with the core values of North Tampa Christian Academy, we seek to support young children as they develop the skills of exploring, choosing, creating and solving for God’s glory. Creative Curriculum, a research-based, comprehensive program approved by the state of Florida, provides the basis of our curriculum. With its focus on long term themes of high interest to students, discovery and exploration, Creative Curriculum is a perfect match for our philosophy. Our little ones are able to deepen their understanding in meaningful ways and provide input that greatly guides their learning in this unhurried, rich context. With our developmental approach, this curriculum is supplemented based on the skills, needs and interests of the children in the class within the framework of the standards for early learning. Students learn to take responsibility for their learning, plan and reflect on their actions and explore different modes of gaining new skills and insights. Following a daily schedule, our students gain confidence through order and predictability. At the heart of everything we do is our strong Christian worldview. We are here to help children see God’s love and grace. The Pebbles Bible curriculum uses Bible stories and fun hands-on activities for various learning styles to help children discover God’s love and develop the values of faith and trust. These stories become part of our school culture, serving as a basis for the ways in which we treat others and make wise choices. From blocks to butterflies, sculptures to snacks we strive to help little ones see God’s loving hand all around them. Developed by Dr. Becky Bailey, Conscious Discipline assists children and teachers in developing the necessary social emotional skills needed to establish a positive and loving school family. Through very intentional routines and rituals, students grow to trust one another, their teachers and their environment. Most importantly they learn to be responsible for their actions, to empathize with others, to be valuable and contributing parts of a team, and to make choices that are safe and helpful. Students begin to develop a healthy and empowered view of themselves while learning the ins and outs of being part of a larger team. Deeply rooted in brain based research, Conscious Discipline teachers utilize seven skills to help children deal with their emotions in positive ways. Children first learn to focus on “states of being,” and then become aware of resulting behaviors, developing the metacognitive skills of self-awareness and self-regulation.